For many drivers in Phoenix, vehicle alignment is one of the processes that often gets ignored in general maintenance and repair of your automobile. More often than not, this is due to the fact that most drivers simply do not consider vehicle alignment to be something that benefits their vehicle directly. The truth is that keeping your vehicle in alignment has a few very serious benefits that are a huge help in the long term health of the vehicle. Understanding a little about what exactly a wheel alignment does is the key to knowing just how important it is for your vehicle. At Tucker Tire and Auto, we want to help our customers get the most out of their vehicle by providing the information they need to make the proper decisions on the maintenance and repair of their vehicles. Below is the short list of benefits that your vehicle gains when it is in proper alignment. Gas Mileage - When the wheels of your vehicle are not properly aligned, you engine is actually working overtime to achieve the same power. This in turn forces the engine to use more gasoline than usual to get you the same distance. Proper alignment of your wheels reduces the forces of friction and allows the wheels to turn with ease. This has a direct effect on the gas mileage of your vehicle and saves you money at the pump. Tire Life Expectancy - Alignment issues are easily one of the greatest contributors to premature tire wear. By making sure that your wheel alignment is correct, you evenly distribute forces of friction and wear across all the tires evenly. This is the best way you can make sure your tires last for as long as possible. Whenever it crosses your mind, be sure to take a look at your tires; any uneven wear on the tires is a sure sign of alignment problems which should be taken care of as quickly as possible. Vehicle Control - There are several things which contribute to the proper control and responsiveness of your vehicle. Alignment is one of the major contributors. 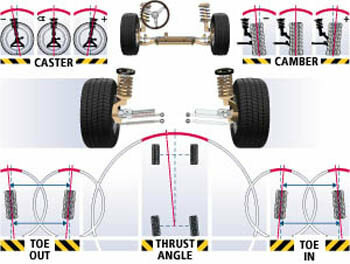 The smooth ride, and proper traction of your tires can only be achieved when the wheels are in proper alignment. If you notice a tendency for your vehicle to drift either to the left or right, or maintaining a straight course seems more difficult than usual, bring the vehicle in as soon as possible and we'll get everything straightened out. We understand that correcting the alignment of your vehicle is not something that drivers think about often. The fact that keeping your vehicle in proper alignment will save you a great deal of money in the long run is the real reason to correct alignment issues as quickly as possible. Not only will you save money at the gas pump, but your tires will serve you well for many years before needing replacement. If you have any questions about what we can do for your vehicle, or you have questions regarding the benefits of a vehicle alignment, we invite you to contact us directly at (602) 266-7480 and speak to any member of our staff. Setting up an appointment for an alignment can decrease wait times and get you back on the road and back to business as quickly as possible. Our staff is on hand to make sure that you get the care and attention that Tucker Tire and Auto is famous for.